Have you ever faced challenges you didn’t know how to deal with, situations that seemed impossible? 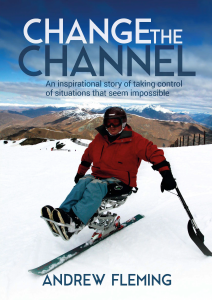 Change the Channel is a inspirational, thought provoking and personal development read. rise above seemingly impossible challenges. Get it for yourself or Give as a gift to be passed on! The 5th of October 2000 is the day farmer Andrew Fleming’s life changed – and resulted in him becoming a paraplegic, a farm safety advocate and a public speaker. It was an ordinary day’s work on his in-law’s Taranaki farm when he was thrown from his quad bike, gravely injured and not found for seven hours. My legs felt like white bait waders full of water hanging down the hill … I was in more pain than I could ever had imagined was possible. From being a fit, active farmer who loved waterskiing and snow skiing – to spending three months in hospital, followed by a long time of rehabilitation and recuperation, Andrew Fleming never returned to the life he knew. His marriage also broke up. His book Change the Channel outlines the everyday struggles coping with not being able to walk, the mental and physical challenges.